With the New Year comes New Year’s resolutions. By far one of the most common New Year’s resolutions is some variation of getting fit or losing weight. While we all know a combination of diet and exercise is the best way to maintain a healthy lifestyle, actually implementing positive lifestyle changes can feel overwhelming or impossible. Luckily, River Road Recipes is here to help! Eating healthy doesn’t have to mean sacrificing on flavor or giving up the foods you love. Take our Curried Chicken Salad from River Road Recipes III, for instance. Substituting low fat Greek yogurt for mayonnaise, toasting walnuts to bring out their flavor (thereby allowing you to cut calories by using fewer nuts), and adding seasonings like curry powder make this a lower fat alternative to traditional chicken salad recipes while still maintaining great flavor. Another great example is JLBR Member Dr. Betsy Buchert’s take on the Olive Egg Spread recipe from River Road Recipes I. Betsyused fresh eggs, substituted Kalamata olives for stuffed olives, and made a few other easy substitutions to create a healthier, yet still delicious, version. Salads are another, more obvious way to eat healthier while still getting the vitamins and nutrients your body needs. Start with your base: there is so much more to enjoy than iceberg lettuce! Arugula, mesclun, kale, and romaine are great, but also check out mâche, dandelion greens, microgreens, baby kale, chicory, and escarole. You’ll be amazed how much flavor and texture they’ll add. Add nuts, seeds, boiled eggs, cheese, chicken, shrimp, or fish to your salad to get much needed protein and to keep from feeling hungry later. Cruciferous vegetables like raw carrots, cucumbers, broccoli, or sweet bell peppers provide that satisfying crunch so many of us crave (and are far better for you than potato chips!). Fresh fruit also adds the right amount of sweetness for those of us with a sweet tooth. Look for what’s fresh and in season at your local farmers’ market or produce store. 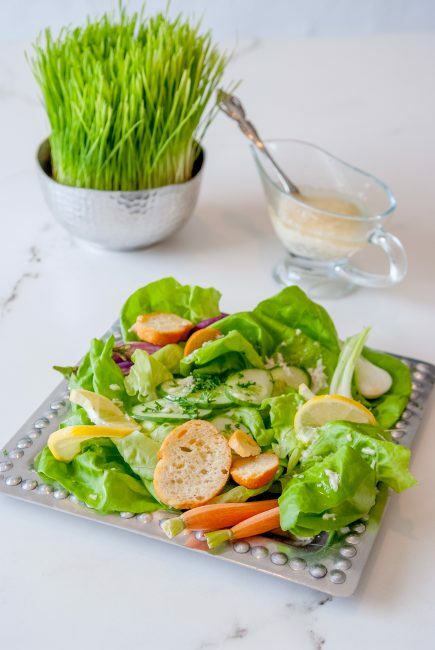 Low fat salad dressings, like our Sensation Salad Dressing (a Louisiana staple!) below, also add great flavor. Just remember to use salad toppings and dressings sparingly, or you may end up defeating the purpose. Happy New Year from all of us at River Road Recipes! Shake all ingredients in a quart jar. Dressing will keep indefinitely in the refrigerator. Especially good tossed with lettuce, water cress, and parsley leaves. Salt and pepper greens as desired before adding dressing.